11th September 2016: Pymble Golf Club have broken a 14 year representative drought after taking out the final of the 2016 Eric Apperly Shield at Liverpool Golf Club today. The team from the Northern Suburbs club had little trouble dealing with an under strength team from the Australian Golf Club, winning five matches to one in front of an appreciative crowd of spectators. 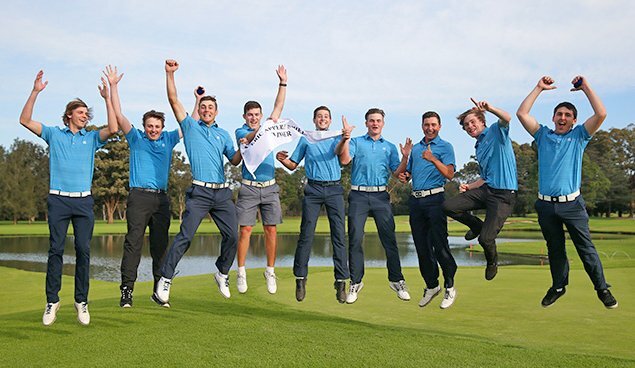 Pymble’s James Conran and team-mate Reid Brown dominated their opponents, recording 6&5 and 5&4 wins respectively to ensure Pymble got the wins it required to take the Shield. The Corey Jones/Thomas Heaton and Joseph Trinder/Isaac Noh matches ended in halves after it was clear Pymble had grabbed the winning points. Conran was happy with his win and the result, his biggest to date. “Before this all I had won was the Duntry League Club Championship, so it feels pretty good. I kept it in play today. I was up the whole match, I didn’t lose a hole,” he said. Pymble began the quest for the 2016 Shield with a perfect five from five win record in the round robin stage. They took care of their northern neighbours, Monash CC in the quarter final four matches to two, then got the better of the ACT/Monaro in a dramatic semi when Corey Jones won his match on the 25th hole after a nail biting week-long delay due to bad light. A 14 year drought was broken in style today when Pymble Golf Club took out the final of the Eric Apperly Shield at Liverpool Golf Club.